Contract Floor Coverings has grown from a small, home-based enterprise to a leader in the Commercial Floor Covering Industry. Our continued dedication to finding and providing top-quality products and our commitment to customer satisfaction have earned us one of the most diverse and prominent client lists in Queensland and Northern New South Wales. Although we claim only 38 years experience, Contract Floor Coverings has a rich history in the commercial floor covering industry, beginning in 1963. Our business began as a home-based partnership between Cor Kop and Eddie Ryan back in 1963 under the name of “Kop & Ryan”. Kop and Ryan opened their first shop on Cavendish Road in Coorparoo. The business continued to grow and the partners sought the services of bookkeeper, Bill Ott. 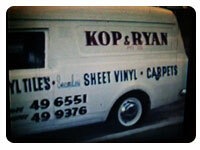 Bill Ott purchased Kop and Ryan and changed the business name to Contract Floor Coverings. The business relocated to a small warehouse on Clarence Street in Coorparoo. Experiencing steady success, Contract Floor Coverings moved to a larger warehouse in Westerway Street, Slacks Creek, which is still the address of our head office. Ron Porter and John Menhinnitt purchased Contract Floor Coverings from Bill Ott. Ron Porter adn John Menhinitt sold Contract floos to Paul Cross. New Owners Paul and Theresa Cross, relocated the business to a new location in Virginia, 4014, QLD. Contract Floor Coverings proudly serves all forms of commercial enterprise including building contractors, government maintenance contractors, shop and office outfitters, churches, schools, medical facilities and retail groups. Contact Contract Floor Coverings to enjoy friendly, experienced service and the convenience of one-stop access to all of your commercial floor covering needs.